The Steelmen secured a top-three finish and a home play-off semi-final in the Evo-Stik League South Division One Central thanks to a 2-1 victory at Aylesbury United last weekend. Their penultimate home match of the regular campaign sees them taking on Welwyn Garden City while their last game of the season at Steel Park will be against Yaxley on Easter Monday while the play-off semi-final will be on Wednesday, May 1. 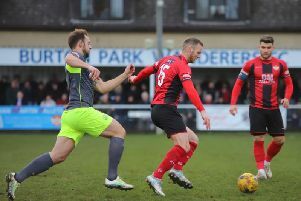 Boss Kinniburgh knows his team must maintain their momentum in the last two weeks of the season as they bid to keep their points-per-game ratio at the right level to ensure they can be promoted should they win the play-offs. But his big aim for this weekend is to ensure the supporters are treated to another good result as Corby seek a third win in a row. “We have still got to keep an eye on the points per game ratio to ensure we can go up if we are successful in the play-offs,” the Steelmen manager said. “But the most important thing about this weekend is that it is our last Saturday game at Steel Park this season. “We have the game on Easter Monday and we will have the play-offs in the midweek after the regular season has finished. “But with it being our last Saturday home match, we hope there will be a few people coming out to watch us. The Steelmen sealed the victory at Aylesbury United without Northampton Town youngsters Jack Newell and Camron McWilliams, who both missed out due to injury. But Kinniburgh is hoping the duo, who are on loan with Corby until the end of the season, will be back in the frame this weekend. “We hope to have the two boys available again,” he added. “We will get some feedback at the end of the week about how they are doing but we are quite hopeful that we can get them back into the squad. “But we have to wait and see. It’s Northampton’s call and we will take the advice of their physios."